The ultimate guide to Claviere ski holidays in 2019 & 2020. The small resort is full of character with a relaxed atmosphere and blend of Italian and French influence. An expanse of snowy terrain throughout the Monti della Luna and the Milky Way on a backdrop of breath-taking panoramas sweeping across the peaks makes Claviere a charming destination for a retreat to the slopes. Nestled in between the pistes of the Italian and French Alps, this charming resort sits high on the Monti della Luna alongside stunning alpine panoramas. Its small town and friendly atmosphere makes for an authentic alpine experience and the excellent snow-record offers exceptional, well-groomed runs sweeping in all directions for full days of cruising the slopes. The nearest airport is Turin and you can jump on the high speed train from Paris to Oulx which is a short drive away. An easy route running through the Milky Way means that those with cars can easily drive over to another resort to ski the day there. Popular with all nationalities, Claviere acts as a retreat for British snow lovers as well as French and Italian weekenders keen to get on the piste. The mixture of nationalities gives the town a unique character that can be enjoyed by everyone. Evenings are filled with fantastic cuisine and cosy drinks in a friendly setting with a lively après ski buzz. Families will appreciate the peaceful, unhurried atmosphere and good childcare facilities while couples enjoy evenings of wining and dining and groups can chose from an array of restaurants to suit every palette and bars to suit every occasion. 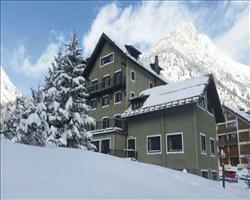 Accommodation suits a traditional ski holiday of cosy evenings in traditional alpine settings. Both the Milky Way and Montgenevre ski lifts run from the resort and with a variety of passes to choose from, you have an ideal base for snowy excursions. The Monti della Luna pass includes Claviere and its French neighbour Montgenevre, offering a wide variety of runs for beginners and intermediates whilst those wanting more challenging terrain can get the Milky Way pass giving you the freedom to venture 400km across the Italian slopes of Sansicario, Sestriere and Sauze d’Oulx. View our detailed Claviere snow forecast or snow report and see all live webcams, piste maps, road and travel maps and lift pass prices. For a picture of historic snow conditions see the snow depths month by month with our Claviere snow history. With some of the best snow conditions in the Milky Way and an expanse of terrain, this resort is ideally positioned for every level of skier and snowboarder. First-timers can find their feet on the nursery slope above the village and progress to the wide open beginner slopes running down from the mountain - opt for the Monti della Luna pass which gives access to Montgenevre for gentle green and steady blue runs. Those wanting a gentle descent and unhurried pace to explore Montgenevre should take the 81 chair to find some lovely runs leading back towards the resort. The ski area is an enormous playground for intermediates, take the 45 chair to La Cloche where you can fuel up at a balcony cafe before ascending the 44 for some thrilling red runs sweeping through the trees. Ski the Colleto Verde where you can enjoy stunning scenery and breath-taking views. If you’re looking for more of a challenge, extend to the Milky Way lift pass which covers 400km including the neighbouring resorts of Sauze d’Oulx and Sestriere. You can ski across the Milky Way from the top of Colle bercia, getting the bubble across to Sansicario which connects directly to some steeper reds. Any advanced skiers will also enjoy the routes towards Sestriere to tackle the Olympic Kandahar runs. Back at Claviere, there are some steep descents for experts with black runs across the border and some exciting off-piste to explore. High on the Monti della Luna you will experience some stunning vistas which can be greatly appreciated on the cross country skiing tracks across the border and numerous wide open plateaus. Boarders should head towards Montgenevre where they’ll find a boarder cross for a bit of high-speed competition and there’s a snow park in Montgenevre itself for some freestyling. Full of character and buzzing with charm, the après scene offers a friendly and relaxed atmosphere after a long day on the slopes. This is a real foodie’s haven with a mix of French and Italian influence offering cuisine to tickle your taste buds accompanied by Piedmont’s finest Bombardinos. There’s a lively atmosphere in the town with a host of restaurants and bars awaiting your arrival. When you’re ready to relieve yourself from your skis, head straight to Mi Chi Bar where you can enjoy après drinks and chocolattas laced with Grappa. After working up an appetite on the piste, Pizzeria Kilt will definitely satisfy your hunger pangs - this casual eatery is known for having the best pizza in town where you can enjoy a family friendly atmosphere. On the piste you will find the terraced chalet Monsoleil for a wonderful taste of mountain delicacies to fuel the rest of your day. You can also take a skidoo ride to the chalet for an evening of fondues and delicious Italian meats. For a more refined evening, Il Gran Bouc offers authentic cuisine with a prestigious wine list and there’s also a wine bar here which is popular for casual evening drinks. Gallo Cedrone livens up for après drinks and a touch of karaoke whilst those wanting more of a party can head to Murphy’s igloo. In traditional Italian style, the town has a number of quaint cafes filled with mouth-watering pastries and Lugara bakery is a favourite amongst skiers. There are loads of shops where you can stock up on some delicacies or treat yourself to some new winter gear. Non-skiers will enjoy the variety of activities on offer including a natural ice-rink and snowshoe hikes through the forests. You can even take a skidoo ride up the mountain to stop of at a charming balcony café for a hot chocolate against a breath-taking backdrop of the mountain. When is the best time to ski Claviere? This resort boasts some of the best skiing conditions on the Italian side of the Milky Way. Its north facing slopes above 2,000m have given the area a history of excellent snow conditions throughout the season. Popular with families, the resort is busiest at holiday periods yet the slopes remain uncrowded and unhurried. The mountain fills up at the end of the week with French and Italian weekenders but lift queues are still minimal and you can enjoy the relaxed pace of the slopes. Families are extremely well catered for here with some wonderful childcare facilities on and off the piste. Some of our hotels offer childcare facilities during the day and put on pyjama parties at night if you’re taking any children that are too young to ski or fancy some quality adult time. Hotel Grande Claviere is ideal for families with wonderful facilities, a comfortable atmosphere and just a 5 minute walk to the lift. Our hotels offer catered accommodation so after a long day on the slopes you don’t have to worry about the meal plan and can settle down to a cosy meal without raising a finger - the perfect way to relax in the evening. Young children are sure to gain confidence with the ski schools on the nursery slopes - when they’re feeling more confident they can venture further up the mountain where you’ll find some lovely routes that everyone can enjoy together. Skiing the Monti della Luna makes for a lovely family day out with loads of wide-open blues at Claviere and some gentle greens at Montgenevre. The 45 lift takes you to the 91 where you can meet lift 44 to cruise down the windy blue 90 sweeping in and out the trees. You can also take the 81 lift across the border for some more steady runs at the French resort of Montgenevre. Families can enjoy a number of family-friendly restaurants in the resort which cater well to all tastes. Pizzeria Kilt is ideal for a relaxed pizza night whilst Il Gran Bouc also has a large menu to suit the whole family. For any non-skiers, there are a number of shops to rummage through and some quaint café-bakeries to spend a relaxing morning or afternoon. If you’re planning a holiday for a group where everyone is at different skiing levels and has different ideas about where they want to go, book a holiday in Claviere – with vast and varied terrain over the Italian and French Alps, there’s something here for everyone! The accommodation here is well suited to groups with comfortable hotels near the resort and right next to the lifts. Hotel Miramonti is ideal for groups, well located near the lifts for skiing over to France and the Milky Way. The huge expanse of terrain to explore across the Milky Way and the Monti della Luna means that every member of your party will find something to suit them. Beginner and less confident skiers would be best to choose the Monti della Luna lift pass which also gives access to the neighbouring Montgenevre with plenty of terrain to explore. Intermediate and advanced skiers are also well catered for here – the area is abound with steeper reds and challenging black runs. For more of a challenge, the Milky Way lift pass gives you access to the neighbouring Italian resorts of Sansicario, Sestriere and Sauze d’Oulx. After everyone’s skied the runs that suit them, everyone can meet on the Mountain at Chalet Monsoleil to share stories over some rustic Italian food and hot chocolates. As us about our holidays including ski pass offers for some money saving deals. For groups looking to party, the après scene here keeps everyone happy with a variety of excellent restaurants and lively bars where you can spend your evening drinking with friends. For a casual evening head to Pizzeria Kilt, known for the best pizzas in town and go on for a night of casual at the wine bar at Il Gran Bouc. Any budding pop stars can get involved in some karaoke at Gallo Cedrone and for partying into the early hours, head to Murphy’s Igloo. "Get the local pass and then upgrade while you’re there to ski the whole Milky Way"
It was my first time in Claviere and I would definitely go back. I am a boarder and I went with a skier; the ski area was good for both of us. It’s mixed terrain. Claviere is in the middle of the Milky Way ski area, so we had the option to go both ways along. We were quite busy all week getting round all the miles. First we skied Claviere, then went over and did all of the French area (around Montgenèvre), then Sestriere and right across to the furthest Italian areas. The slopes were quite quiet and the snow was good. We went off-piste a bit, the area around Sauze is good for this, and Montgenèvre. There are only a few bars in Claviere but that meant that they were relatively busy. My advice if you come to Claviere is to get the local pass for a week and then you can always extend it while you are there. It was simple and easy and relatively cheap to upgrade our passes. "Small resort, not the best access to whole Milky Way"
Claviere is quite small in itself - the link to Montgenevre is good but the link to the rest of the Milky Way is pretty tedious and takes 45 mins to 1 hour just on the gondolas. The skiing wasn’t brilliant for beginners as the track back from Montgenevre is quite a tricky black, a mother and daughter we skied with had to go back through the valley. We were both intermediate skiers and the area was no problem for us. The snow over New Year’s week was excellent but the celebrations were a bit of a fizzle – the place I was at the year before had a disco party on the slopes which my Great Nephew loved. Here they just had a gathering in the village with some fireworks being let off left, right and centre. If I was going to come back to the ski area again I would stay in Montgenevre as there’s more there.